PHOENIX — As recently as Tuesday, a defiant Arizona governor refused to meet with teachers threatening to strike over low pay and said he was sticking with a 1 percent raise proposal. By Thursday, Republican Doug Ducey managed to scrape $274 million from the cash-starved state’s coffers to offer a 9 percent wage hike starting this fall. He’s following that with 5 percent more each in the 2019 and 2020 school years. He’s also counting the 1 percent raise the Legislature approved for the current school to call it a 20 percent overall raise. The teacher-led rebellion over low wages and funding cuts spread from its genesis in West Virginia to Arizona, Kentucky and Oklahoma. Arizona teachers are among the lowest paid in the nation. The Great Recession forced legislatures nationwide to slash budgets and make major cuts across all spending areas. However, in Arizona legislators also passed major corporate tax cuts designed to phase in as the economy recovered. As such, Arizona’s budgets are still exceptionally tight a decade after the recession. In addition to a 20 percent pay bump, Arizona teachers also demanded a permanent raise structure, a $1 billion boost to put education funding at pre-recession levels and no more tax cuts until per pupil spending matches the national average. Ducey was vague about where the cash would come from, only saying a growing economy and lower spending in other areas unexpectedly freed up $274 million this year. He’s also said he would cancel some of the planned spending in his budget and use savings from government efficiencies. Teachers who organized a grassroots effort that drew nearly 45,000 members were cool to the announcement, saying they wanted details before reacting and lacked trust in the governor. Arizona educators were encouraged in part by successful teacher walkouts in West Virginia and Oklahoma. Those teachers shocked their state’s leaders by surrounding their Capitols and demanding funding after years of cuts, setting off similar feelings in other Republican states. Thousands of teachers protested Monday in Oklahoma and Kentucky, demanding higher wages and more resources for students. So far this year, teachers in four states – each with a Republican governor and legislature — have walked out of classrooms to press for more school spending. John Yang talks with Liana Loewus of Education Week about what’s happening around the country. Earlier this week, the grassroots organization Arizona Educators United told their Facebook members to prepare for a possible walk-out that would close schools. 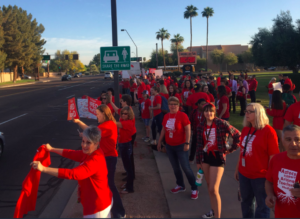 On Wednesday, Arizona teachers and others held “walk-ins” at more than 1,000 schools to draw attention to their demands. Teachers, students and parents donned red and gathered outside campus before school began to demonstrate as part of the #RedforEd campaign. Ducey bent to their demands on Thursday and pledged to push the new proposal through the Legislature in the coming weeks. “It was interesting to see that a few days ago the governor had dismissed us as political theater and now he’s impressed,” Harris said. Arizona teachers are among the lowest paid in the nation, with elementary instructors earning a median 2017 wage of $43,280 and high school teachers $46,470, the 3rd and 6th lowest in the nation, respectively, according to the federal Bureau of Labor Statistics. Adjusted for local cost of living, federal figures show elementary teachers actually rank 49th in earnings and high school teachers 48th. Ducey says the average teacher earned $48,372 last year. Under his proposal, average teacher pay would go to $58,130 by the start of 2020, Ducey said, without taking money he promised earlier in the year to restore previous funding cuts. The teacher pay boost will cost and $650 million by 2020 and go into the base school formula that increases for inflation each year. The proposal doesn’t increase funding for other school needs. But he already proposed $100 million in his budget plan as a start to restoring nearly $400 million cuts made earlier in the decade — including $117 million he cut in 2015. “We know that there are other needs in public education, so there will be no shell games,” Ducey said. “This investment will be in addition to the $371 million in district additional assistance which will provide flexible funding for Arizona schools’ most pressing needs — fixing school infrastructure, modernizing curriculum, school buses and updating classroom technologies.